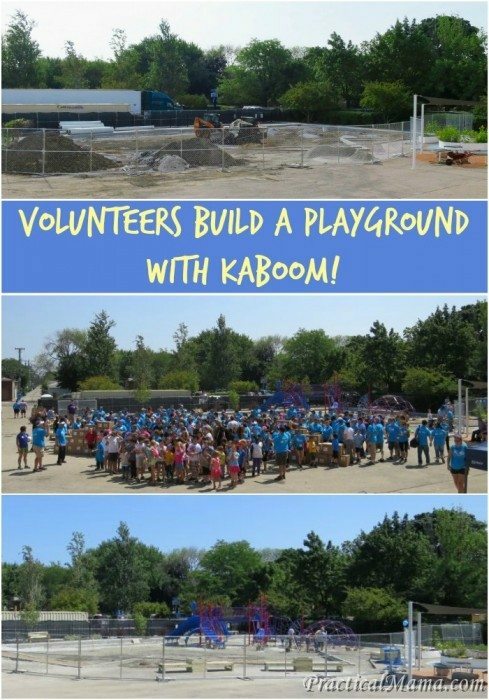 You are here: Home / Parenting / Community Involvement / Volunteers build a new playground with KaBOOM! I have been volunteering with one of the parent organizations at my children’s school, whose purpose is to raise funds for school’s needs. 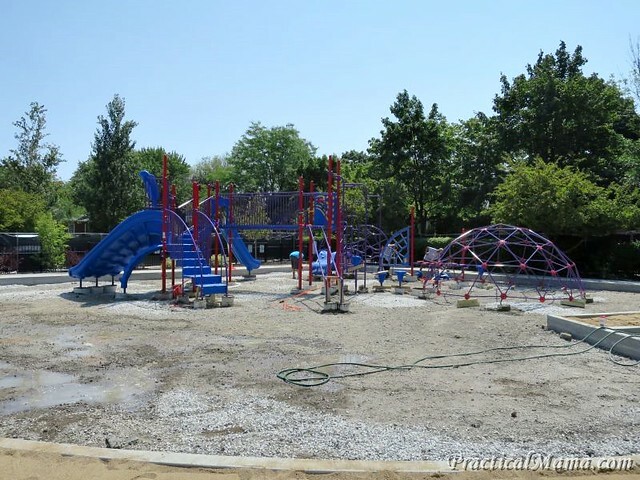 For the last three years, we have been focusing on getting a playground for the elementary school where more than eight hundred students attend. 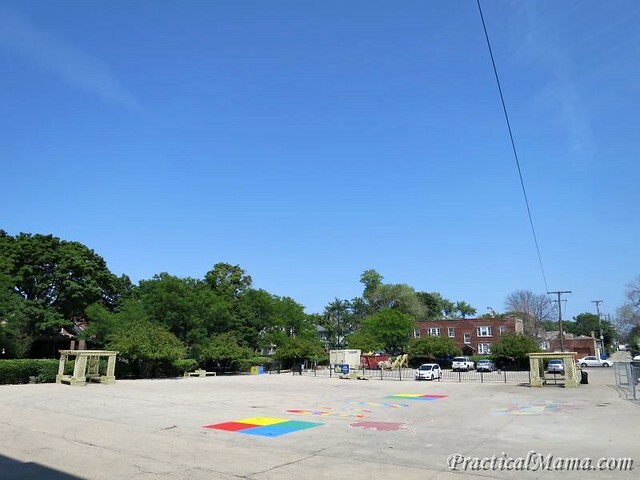 Especially after the school hours were extended in Chicago two years ago, children were trying to stay active on a barren asphalt during the recess. 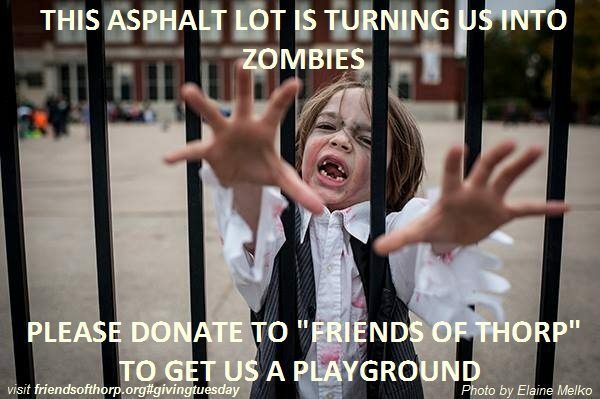 We’ve been organizing activities, fundraisers and auctions to raise funds for the playground but a safe and good quality playground costs a lot. 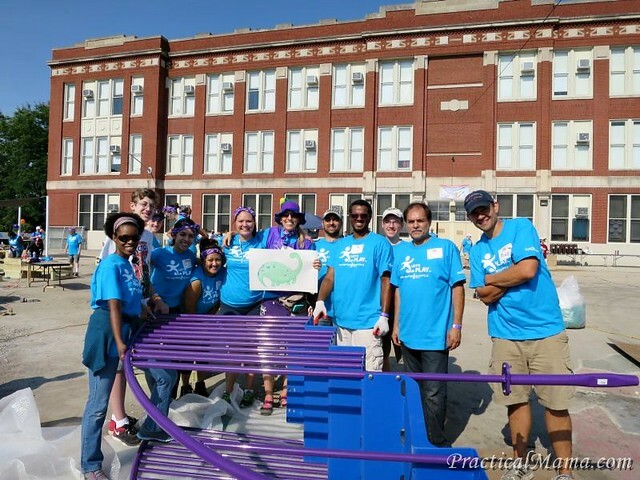 Fundraising & grants committee has been pursuing few grants along with KaBOOM!, which is a national non-profit dedicated to saving play for America’s children through community partnerships and playground construction. I will be abbreviating the story of our application quite a bit. After numerous interviews, our school received a playground grant through our organization’s application. KaBOOM! 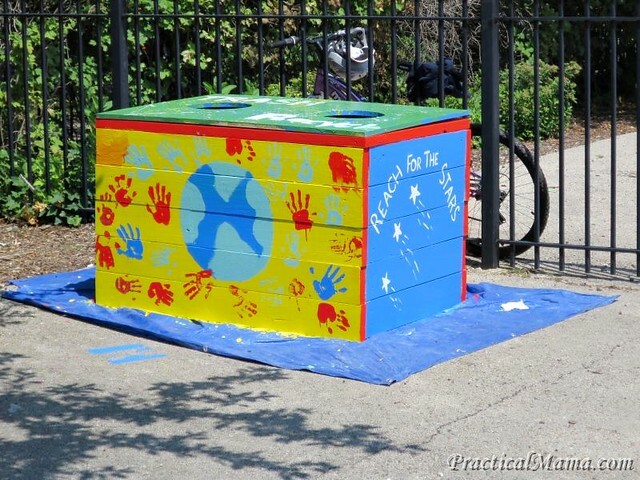 matches schools and communities in need of a playground with sponsors. Then they manage the build project. Our sponsor was Dr. Pepper Snapple Group. After the receipt of the grant, we went through design selection process. 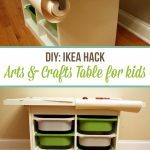 This process involved students, parents and community members. Once the design was selected, the build day was set to August 9. We spent the 3 month until August 9, preparing, i.e. signing up volunteers, procuring food, tools, logistics, youth activities etc to build a playground in 4 hours. 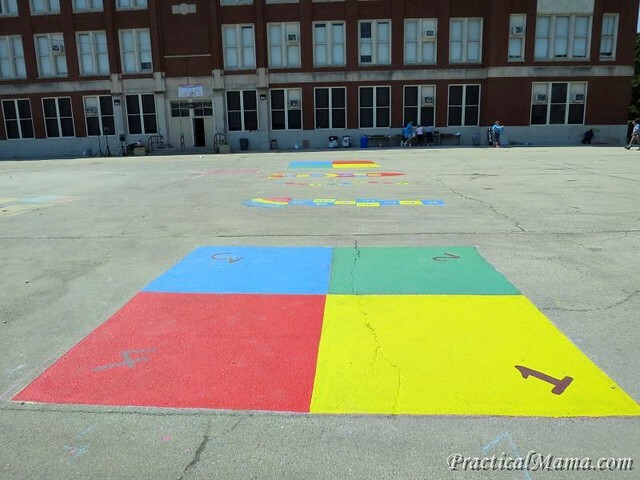 Before the build day, CPS prepared the ground as per their own specs. We also had some side projects. We also needed to prep before the build day, to set the playground up in 4 hours. 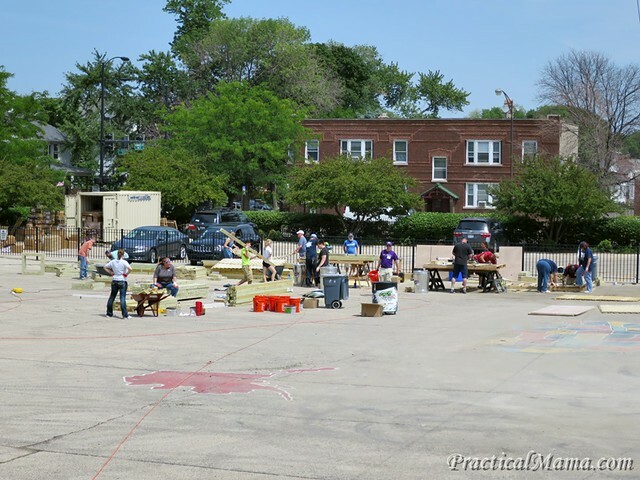 50 volunteers came to school on Thursday, August 7, anf Friday, August 8 to unload playground parts, cut wood and prepare post bases for the playground. All tools were donated (lent) from businesses and individuals. After cutting the wood, we started putting together the infrastructure for some side projects. 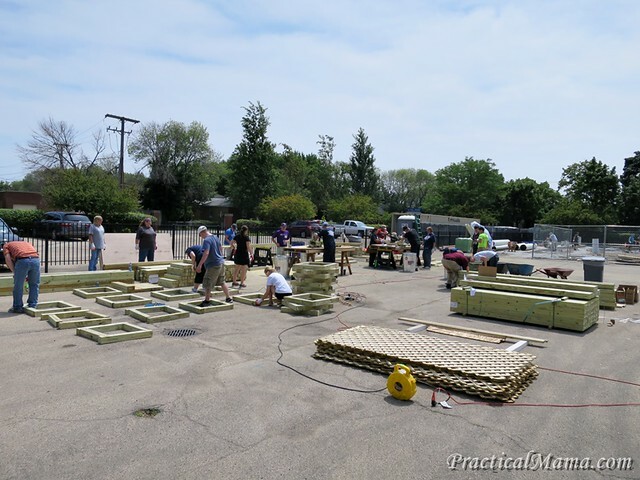 Volunteers worked on quite a bit of woodworking projects on Thursday and Friday. Another group of volunteers prepped the post bases for cement. Kids kept busy by preparing posters, banners and other materials needed for the Build Day. Not one single person stayed idle. 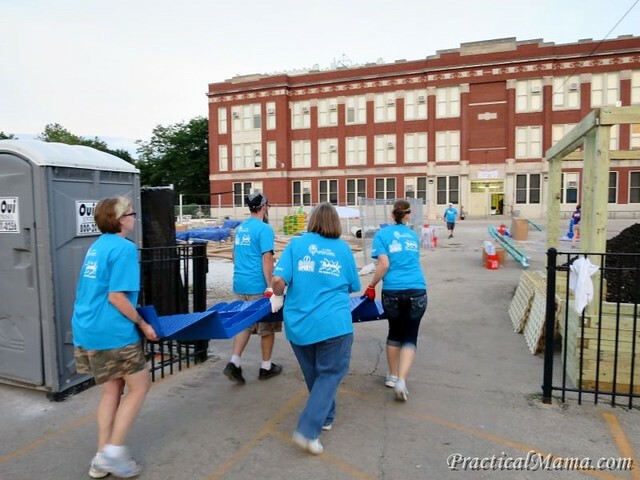 On Build Day, Saturday, August 9, a group of us arrived at school between 5:00 and 5:300 am. 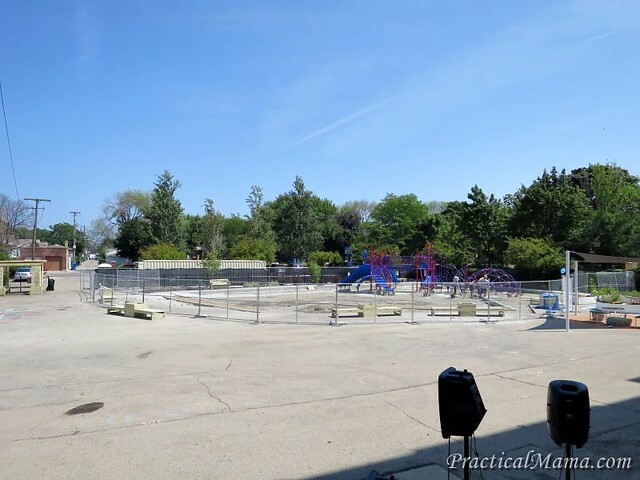 We unloaded the playground pieces and set them up in their respective places, so that teams could get to work as soon as they arrived. Build Team Captains were assigned their projects and team logos. 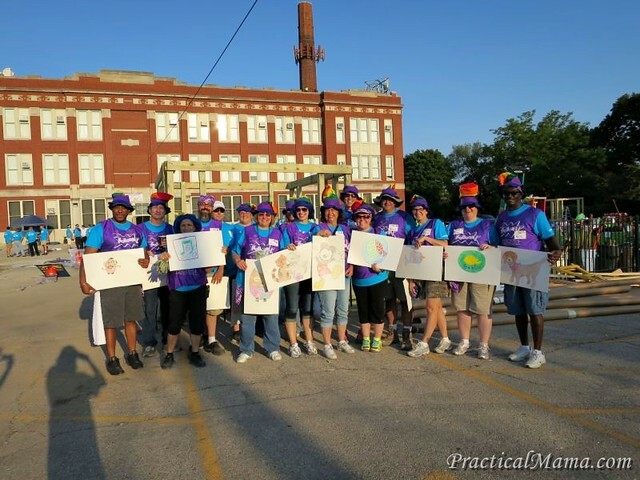 There were many volunteers from our parent organization as well as Dr. Pepper Snapple Group. More than 300 adult and 150 child and youth volunteers arrived at 7:00 am. 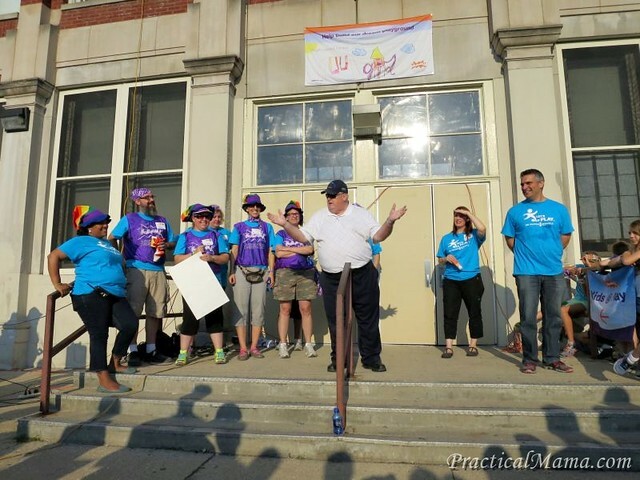 Everyone had breakfast and Build Day was kicked off by speeches from our sponsors and community leaders including our Alderman ans school Principal. By 9:00 am a good portion of the playground was up. 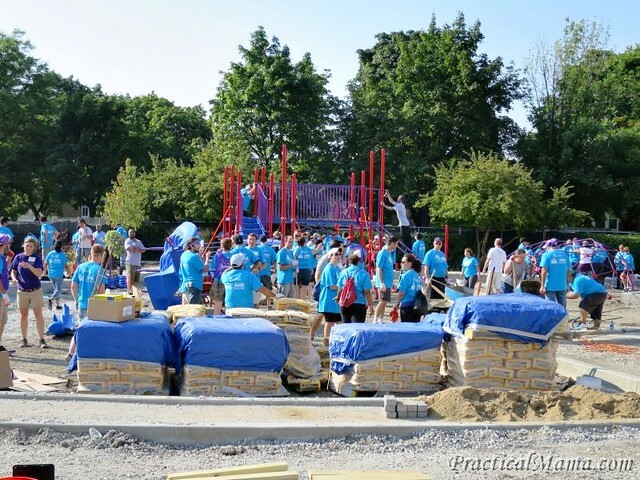 Some build teams were assembling the parts of the playground and as they were completed, other teams were attaching those parts to the base. My team, Team Dino, finished up assembling 5 pieces of equipment, one of which was this huge transfer station by 10:30 am. As the pieces were being attached to the playground, cement team were mixing cement to fill up the posts. I think this was the hardest task. 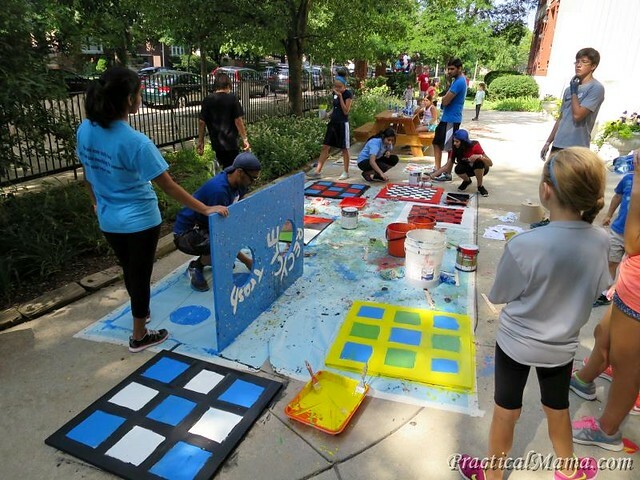 Youth and kids were busy with painting site project parts, such as game boards. 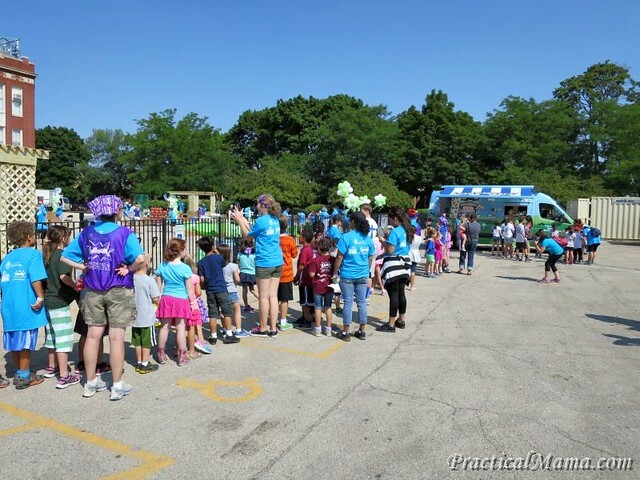 Right before the finish, Ben & Jerry’s Ice Cream truck arrived. Kids were ecstatic. Everyone loved the flavors they served. 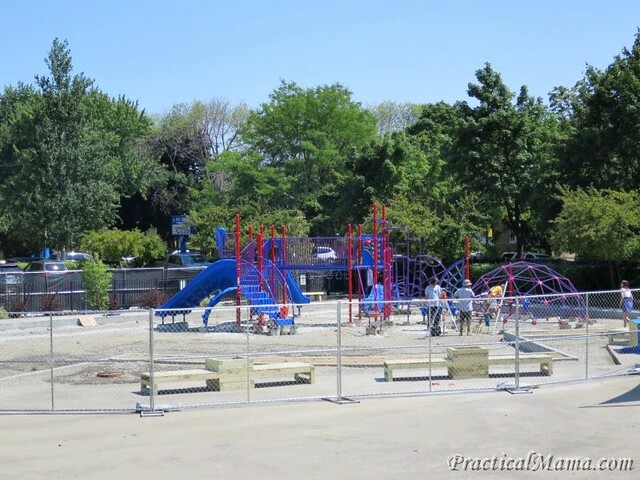 Believe or not, by 12:00 pm, the playground was finished, in about 4 hrs. Every single person on that playground worked like bees. When someone was finished with a task, they asked captains and leads where else they could help. Around 12:10 pm everyone got together for ribbon cutting and opening ceremony. Ribbon was cut, photos were taken and it was a wrap by 12:30pm. Playground equipment installers (professional team) continued to work on the playground a little bit more, I guess, to make sure every bolt and nut were properly fastened, clamps were secured, posts were set. 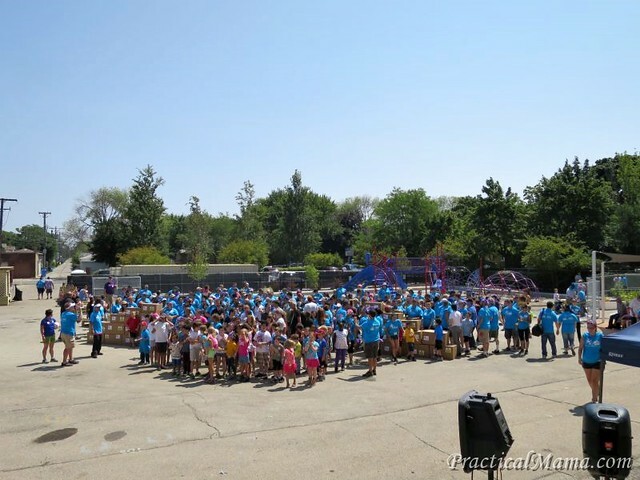 In the afternoon, kids went on to have fun with Dr. Pepper Snapple Group‘s Play Day. They setup big inflatables on the other side of the school. They had balloons, face painting and other activities. 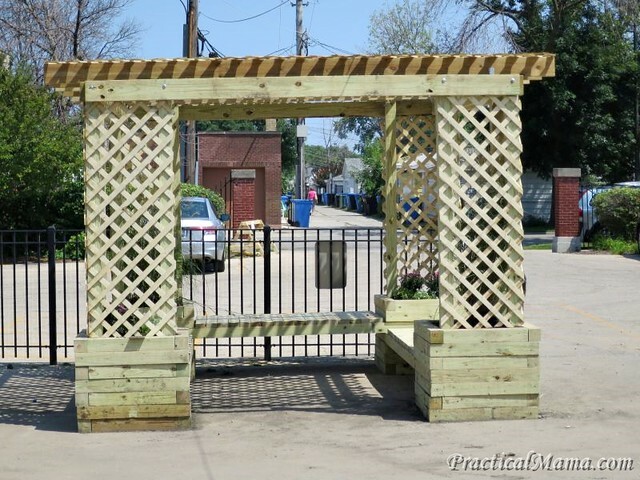 In addition to the playground, volunteers put together some really neat side projects to beautify the school lot. 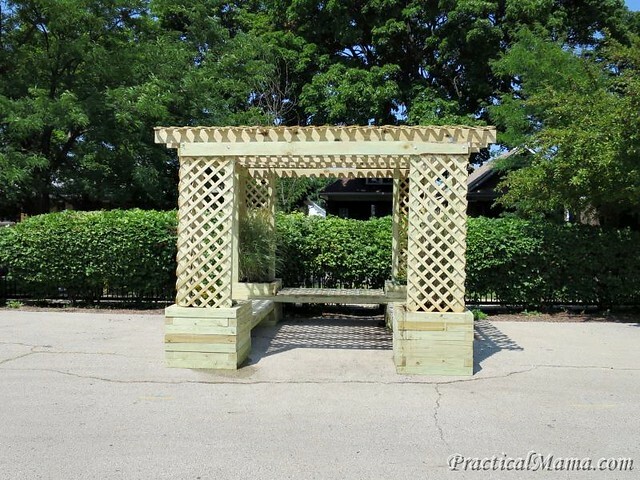 They built 2 of these shade structures, which we tested and approved after the build was finished. 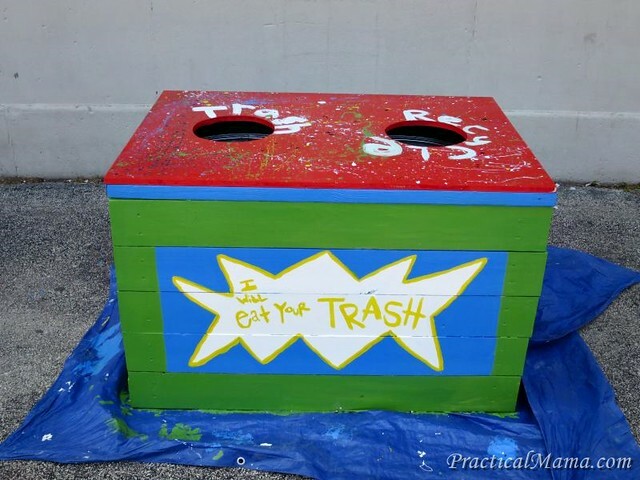 3 trash and recycling receptacles were built and hand painted. Some volunteers painted games on the ground. 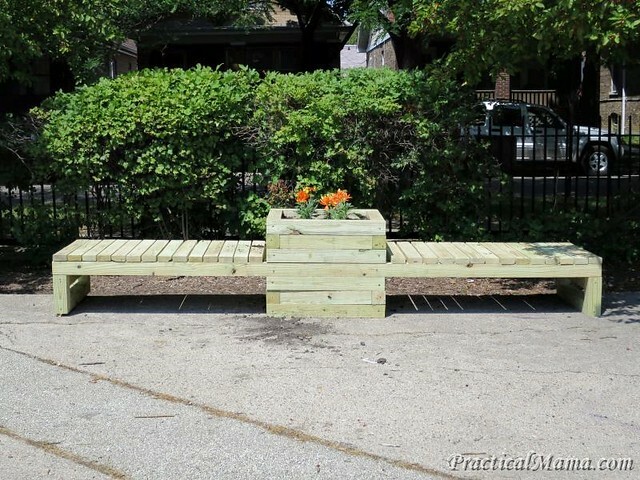 4 of these big benches were built and sanded. This one has flowers in the middle. Some has board games (painted by the children). 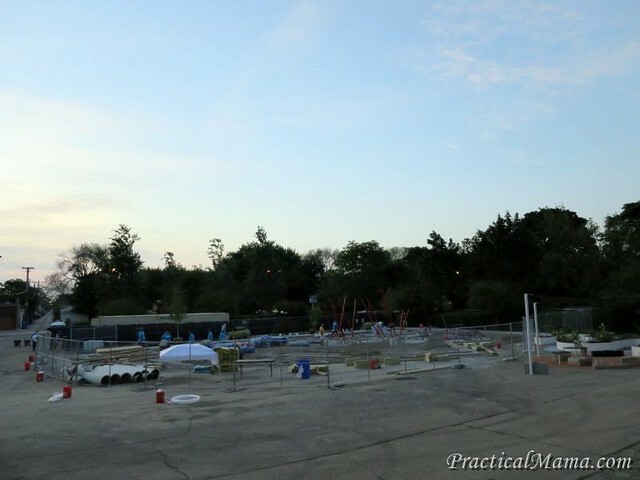 North side of the lot that was empty until last week now has 2 shade structures, benches and games. New trees and plants were planted around the playground. 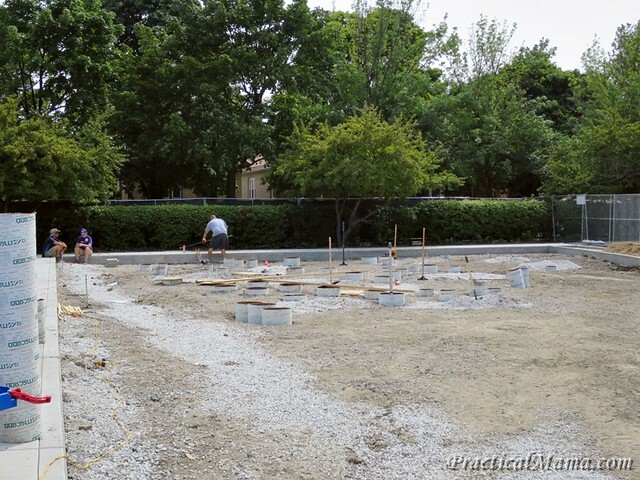 Next week, contractors will pour cement and then cover the ground of the playground with soft surface. 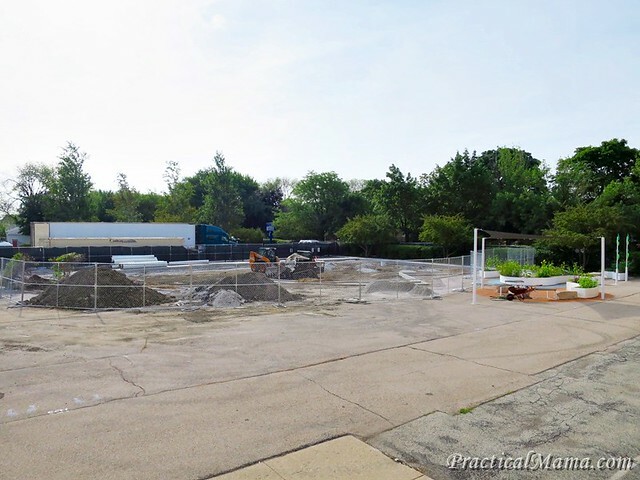 Playground should be ready by the start of the school. Welcome to our new playground! To me this playground represents much more than a safe place to play and stay active for the kids. 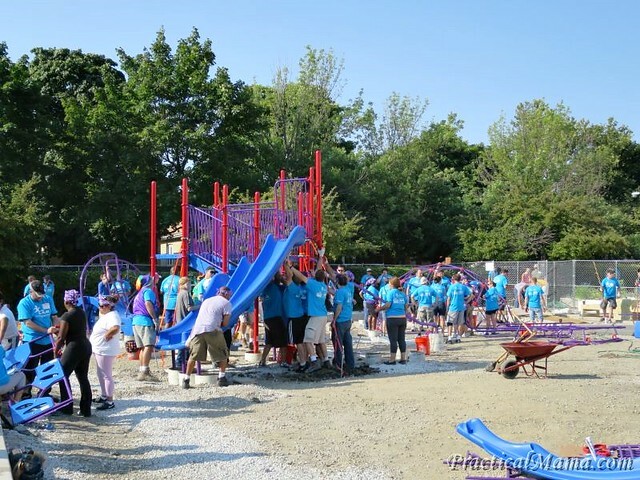 This playground is the fruit of parent and community involvement. It is built with our own time, effort and sweat (luckily no blood and tears. Ok, maybe some tears of joy). 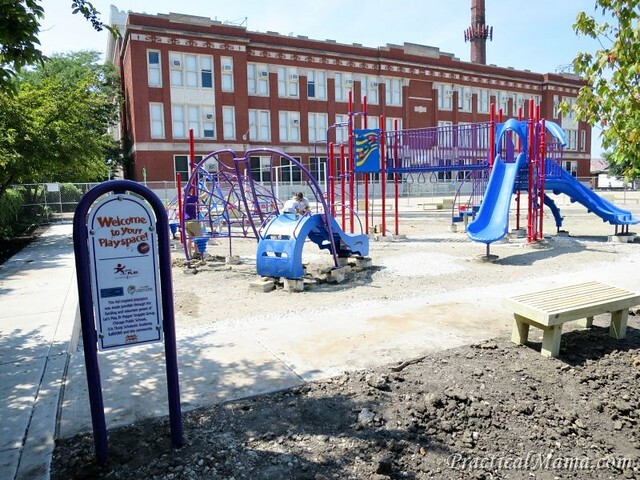 Parents and kids will value this playground more than any other because everyone has worked for it. I am grateful that my kids are going to school with the kids whose parents are closely involved in their children’s education, well-being and the school. I cannot wait for my kiddos to come back from vacation and see the new playground. Both of them will be ecstatic.